Plants require three major nutrients - Nitrogen, Phosphorus & Potassium for its growth and development.AGRORGANIC® NPK is a combination of Nitrogen, Phosphorus, Potassium chelated with Amino acids. Nitrogen is the major component of amino acids, the critical element constituent component of proteins and is a necessary component in cell structure, plays a very important role in cell division and reproduction. Phosphorus is vital for adequate root development and helps the plant resist drought. It enhances flowering and increases fruit and seed production. Potassium Improves the quality of seeds and fruit. It also helps to improve crop resistance to lodging, disease, and drought. 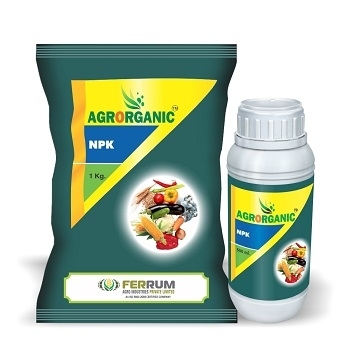 AGRORGANIC® NPK also contains other nutrients in required amount for better yield and quality. Recommendation: vegetables, paddy, wheat, maize, fruits, cotton, Cereals, horticultural crop and all other crops. - Promotes the development of the healthy primary roots and their subsequent branches. - Enhances the flowering and reduces the flower drop. - Helps in higher photosynthesis and formation of energy-high compounds (EHC), boosts vegetative growth. - Increases the yield and quality of the crop. - Increases the resistance power of the plant by strengthening the immune system. - Plays an important role regulating water and nutrient movement in plant cells. - Activates plant enzymes which help in the synthesis of carbohydrates, amino acids and protein.